What I would like to know is why mustaches are so darn popular. The picture below that I took with my 'umble Canon Powershot A560 is my most popular piece in my Deviantart with 66 favorites and over 300 views. And on Weheartit (where one of my fellow Deviants shared it), it has 193 hearts. Wuuuuuut? I mean, I'm GLAD mustaches are popular. Obviously I like them too, because I wanted a necklace of one (I had seen them all over the internet and I just HAD TO HAVE ONE). They're a hipster staple. They're very trendy. 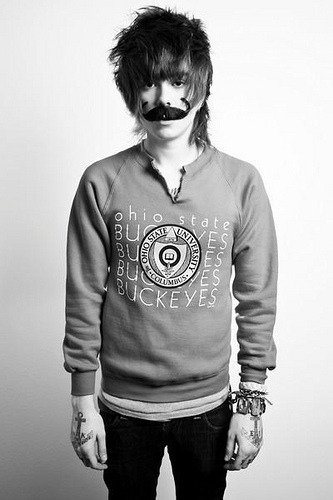 ^^ Even Christofer Drew Ingle of Nevershoutnever likes them. But WHY ARE THEY POPULAR?! I guess we'll never know.